Reached number 8 on the U.K. album charts spending 28 weeks on the chart. I really love the cover to this album, the stage view of all the cast and then their individual live pictures really sets the scene for what we are going to get on this album plus all the other great pictures on the back cover and both sides of the inside sleeve bring back so many great many memories of the concerts and how energetic and inspiring the show was. The pictures alone make this album quite unique. The cast really put on a wonderful show full of excitement and emotion. The live element and the audience participation and the little snippets of conversation we get also give this album a unique and high energy feel to it. Debbie Allen, Gene Anthony Ray & the Waters. We start off in great Fame style and Debbie's energy is all over this track as she encourages the audiences to get on downs. For me this just has that extra excitement to the original episode version and I like that Gene is included on vocals too. I never understood why he wasn’t included on the episode version. "Could We Be Magic Like You" written and performed by Lee Curreri & The Waters. I love this live version of this song, it’s just so beautifully and dreamily sung and performed by Lee and always seemed to be a particular favourite with his fans. I love how there is almost complete silence when Lee sings “a Sudden Hush”. For me this is Lee at his best. The song works so much better with Lee and the backing singers rather than being a duet with Debbie like the original. Carlo Imperato & The Waters. Another great bouncy number that Carlo sings enthusiastically. Even though this song was new to audiences when we first heard it, it is such a catchy pop number that it really got the audience going straight away and Carlo whips the audience up with his "Everybody here loves Fame…" statement. The only single to be released from the album and the last single to become a proper hit for the cast in the U.K. 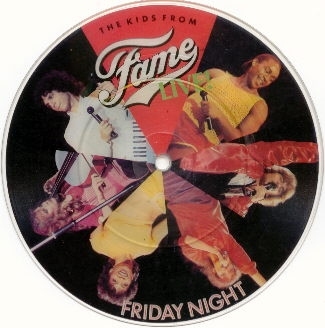 The single was also released on picture disc. Gene Anthony Ray, Carlo Imperato & Erica Gimpel taking Valerie's part. The live version is every bit as good as the TV and album versions and it was nice to see the story acted out on stage in front of us. Although I’m convinced Gene isn’t actually performing some of the higher notes and they are done by the backing singers. The Kids From Fame & The Waters. The live version which includes the actual ending rather than the song fading out as on the original album is my favourite and I always found it just that little bit more emotional than the album version. “Hi Fidelity” written by Enid Levine and performed by Debbie Allen & The Waters. With Valerie unable to make the first tour Debbie takes over on Hi Fidelity. I always wondered why they didn’t just leave the song off the set list but I guess as it was a big U.K. single audiences were expecting to hear it. Debbie’s involvement gives this a really different feel to the original and it’s nice to have both versions for the contrast. Gene Anthony Ray & The Waters. This song has never been a favourite of mine and to be honest I can’t tell too much difference between the live version and the original version. “Be My Music” written by Lee Curreri & Ethan Hurwitz. This is a wonderful medley of some of the best emotional and sentimental ballads the cast recorded. Everything is perfect and fits together wonderfully apart from Lori’s solo vocals. She wasn’t the best singer and it really shows here where’s she’s singing solo. Even the backing vocalists can’t hide the harshness and weakness of her voice. However that really is just a small gripe to a wonderful part of the show. I love the emotion between Erica and Debbie and I love how the cast harmonise on the wonderful “Be My Music”. This is a Fame classic and the live version including all the cast members is stunning. It’s totally energetic, motivating and feel good. performed by The Kids From Fame & The Waters. I love this live version, again all the cast get to sing on it and the live energy really lifts the song from being great to fantastic. This starts with an incredible explosion that always gives me goose bumps as I remember how happy and excited I felt actually being at one of the concerts. The excitement and energy continues right through to the end with an excellent version of the theme tune but I’d rather have more of the cast and less of the Waters. "Friday Night" was reelased as a single in March 1983 and reached number 13 on the U.K. singles chart with "Could We Be Magic Like You live" as the B Side.